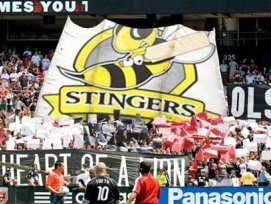 Stingers fans and players get everywhere! And they are wearing their Stingers gear with pride all around the world. Email us your picture and we'll upload it onto the website. Stingers fan John from Scotland displaying his batting technique in Colakli, Turkey. Ian Scrine, Penlan RFC Captain, watching the Bluejays against Cleveland Indians at the Rogers Centre in Toronto, Canada. Christian Hanns and Franz Heyderahl both from Norway, onto of Mount Blanc in the Alps with their Stingers towel! Stingers players Van, Mogsy and Chinny with 'Gavin and Stacey' actor Dai Coaches at Sophia Gardens watching Glamorgan C.C. Flag spotted at the South Korea v Greece World Cup game. Thanks Mark from Newcastle for sending us this pic. Wilson with new Stingers supporter barman Ali 'Shish' Kebab in Colakli, Turkey. Van getting a little wet on the 'Maid of the Mist' at Niagara Falls in Canada. 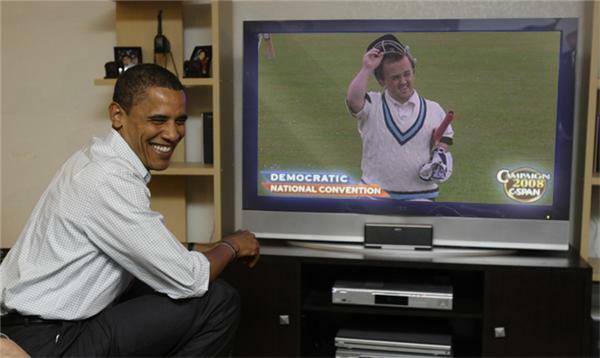 Obama interupts his national convention show just in time see Gavin Morgan walking back to the pavillion on Stingers TV. Richard Roberts of the Stingers outside Sophia Gardens with ex-England cricket international Simon Jones.